The Student American Dental Hygienist’s Association is the student organization of the American Dental Hygienist’s Association (ADHA). 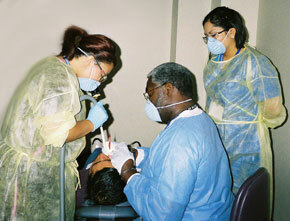 The mission of the ADHA is to advance the art and science of dental hygiene. The dental hygienist of the future must be capable of responding to the disparities that exist in oral health care today. The Service-Learning experiences provided in the Dental Hygiene Program foster leadership, cultural competency, lifelong learning and a commitment to caring for the underserved. Rotations and community projects allow the student to be involved in local, state and national efforts to improve the oral health of the community. Through participation in Special Projects, The Dental Hygiene Program offers opportunities for the dental hygiene student to expand their education to include experiences within the professional roles of dental hygiene including clinician, educator, researcher, administrator, and community advocate. In an effort to provide much needed service to the community, dental hygiene students have an opportunity to expand their skills and experiences outside of the dental hygiene clinic by traveling to several sites during their last semester of dental hygiene school. For 5-6 weeks, students provide dental hygiene care, to include a complete prophylaxis, deliver individual preventive education, place pit and fissure sealants, and administer topical fluoride treatments.